For most homeowners, their home is their castle. They feel they have one of the best homes on the block, so when their house gives off a less-than-ideal first impression, many emotions can come into play. Homeowners must first understand that landscaping can make or break a potential tenant’s willingness to pay top market rent and keep the property pristine. This article outlines ideas to help your castle stand out for little or no out-of-pocket cost. There are many resources where you can get assistance, from neighbors to government agencies, and your local Real Property Management office can guide you to many more upgrades, tips, and ideas to increase your return on investment. Tip #1: Green up from the city. Ever heard of the organization Tree City USA? Through this group, some cities offer free trees to residents. To see if your city participates in this program, check their website. Tip #2: Visit sales for shrubs. 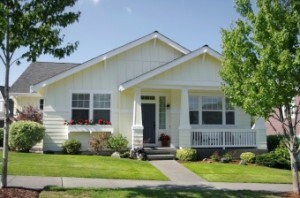 A little shrub can make a big impact on the appearance of your home, and a positive feeling about a house may entice a tenant to pay higher renal rates for the perceived home value. Tip #3: Visit the free online listing sections. Online services such as Craigslist offer “free stuff” sections that have free materials such as rock, pavers, fence posts, and bricks. Sprucing up rock around your home or adding a pathway is an inexpensive way to add value, interest, and depth to your space. Tip #4: Take a walk and talk with the neighbors. When you walk through your neighborhood and see a vegetable garden or flowerbed that has a particularly great flower or fruit, ask the owners for extra seeds or a cutting. Many are happy to share. It is also a good way to spread good relations throughout the community. Tip #5: Hire a gardener. 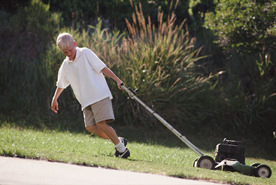 Many owners feel they are more than capable of mowing their own lawns, or that the neighborhood kid who does it for $5 is a bargain. Remember, you get what you pay for and, in this instance, you are not getting much for arguably the most valuable asset. Hiring a professional gardener for even a bi-monthly service is money very well spent. This service ensures the sprinkler system is in proper working order; the lawn is edged, weeded, and maintained at the proper length; and that the property is putting its best face forward. For more tips and ideas for improving your home and increasing your revenue, contact your local Real Property Management office. With over 30 years of experience in the industry, we have the expertise to lead you to the right upgrades at the right time to maximize your property’s income potential.